Over the years, the small cabin-like house expanded into a more substantial structure, until Will had a view of his beloved Stable from his second story study. Views out over the landscape were important to him, as were outdoor living areas like porches and patios, and ready connections to outdoor activity areas. The ranch house has many doors, giving access to the outside from almost every room. Windows were placed to bring the outside inside. A large, seven by nine foot window replaced French doors at the west end of the house. Inspired by the view over looking the ocean, the window was a present from American Broadway impresario Florenz Ziegfeld to Will Rogers. The ranch house is surrounded by spaces for outdoor living. A front porch, patio, screened porch, and shade structure were included when the original cabin was built. Over time, as additions and remodels took place, these outdoor areas were expanded and refined. 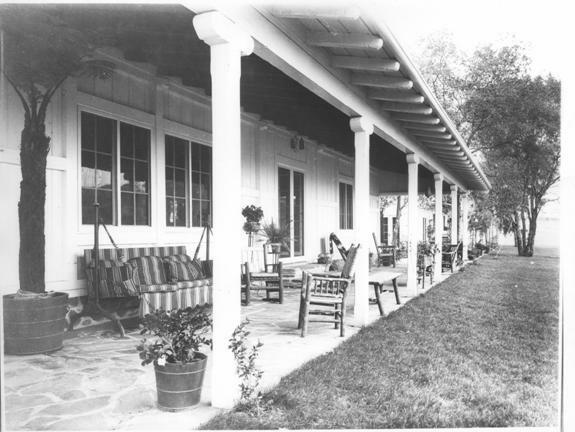 The paddock became a proper lawn; a tennis court was added behind the guest house/garage; the second story suite included a balcony and screened porch overlooking the polo field. The entire area around the driveway, garage, and the south wall of the ranch house was defined with planted beds and rock walls, steps, and pathways. Behind the house, a long, narrow courtyard was notched into the slop, and a unique series of utilitarian structures was developed, including an enclosed laundry yard and lath house. At the north end of the house Will added his notorious “sneak staircase” so he could easily head out to the stables without going through the rest of the house. After that window was placed, more French doors were replaced by windows to bring in light and frame the views of the outside. Will brought in full-sized plants and trees to bring in foliage above the windows and frame his beloved views. 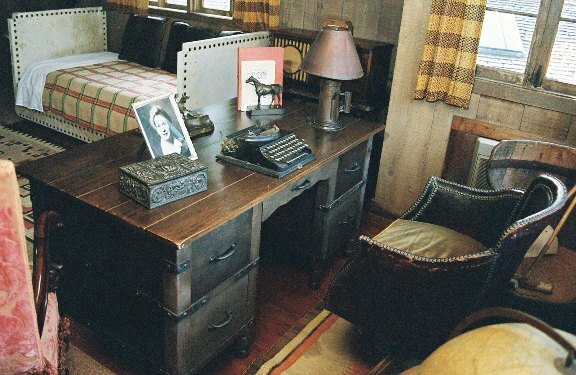 Upstairs in his study, Will’s desk was in front of a large window that looked out toward the stable and the exercise ring and the hills he loved so well. Through this window, before the trees grew so large, Will Rogers could observe his horses grazing while he worked on his newspaper articles. The patio linked the two wings of the house, as well as connected indoor life with the outdoors. The patio was a communal place where family and friends gathered for meals and relaxing together. Comfort and informality marked the lifestyle – they often entertained with informal outdoor barbeques and buffet suppers if there were many guests. More often, meals were shared at a long plank table using mix-matched chairs and covered with plain or checkered table cloths.. If it got cool, a fire would be lit in the outdoor fireplace, an overhead awning would be drawn over the table, and bamboo shades dropped to make an enclosure. The family used the patio not only for meals and entertaining, but to sit and visit together. Betty Rogers would sit on the swing and knit outdoors on the patio. 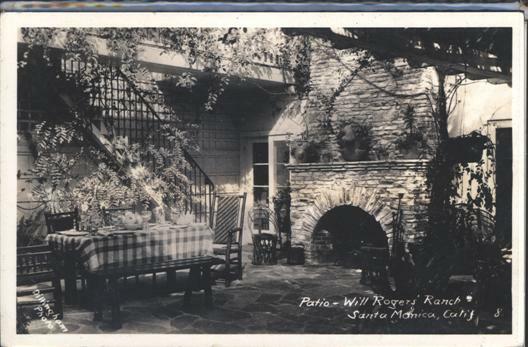 The patio and porch were furnished with comfortable rustic furniture. 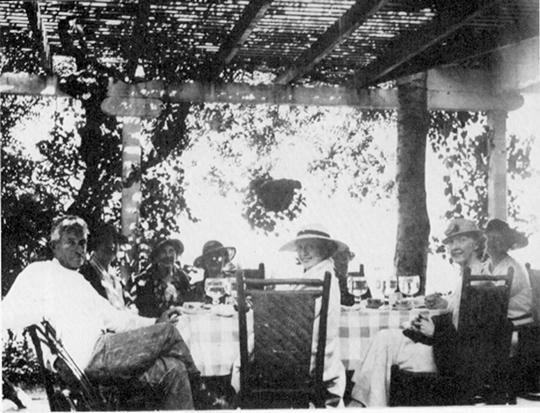 Historic photographs show a California ranch lifestyle that was casual, comfortable, and gracefully social.